Designers Select DaFiddy Oil Based and Oil-less Haze Juice - Formulated for the DF-50 to be the perfect airborne canvass, DaFiddy is the Pro Lighting Designers perfect affordable solution. 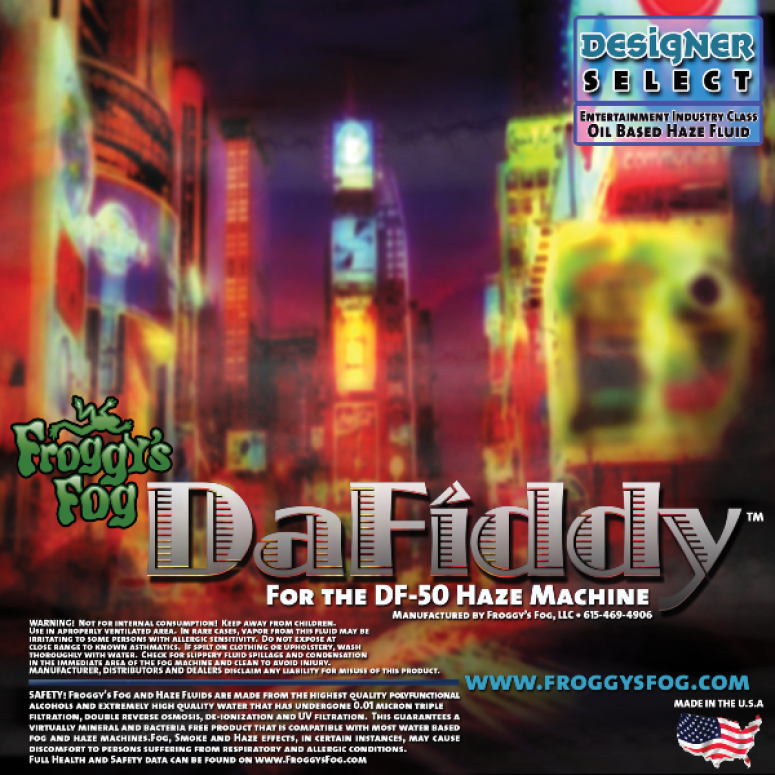 Froggys Fog ensures DaFiddy is made from only the most highly refined mineral oils and has the right Vitamin E Stabilizers so it is compatible with your DF-50 Hazer. The Oil-less solution is a USP Grade Glycol which produces a very persistent haze without the use of oil. Designers Select DaFiddy Haze is a non-toxic solution that produces a long lasting, low moisture haze. DaFiddy Haze is colorless, odorless and leaves little to now residue. All of our Froggys fluids comply with the strictest health and safety regulations, and are formulated to extend the life-span of your hazer. Dafiddy Haze is made from the highest quality pharmaceutical grade mineral oils and Vitamin E stabilizers and adhere to the strict specific gravity and density requirements of major haze machine manufactures so you can be confident it will be compatible with your DF-50 Diffusion Hazer. Oil-Based Hazers produce the perfect haze for enhancing lighting for theatrical, stage and live performance applications. It is far more persistent than water based haze and should reduce your fluid consumption. The Oil-Less Fluid is a USP Grade Glycol which produces a very persistent haze without the use of oil.